I was scanning the Twittiverse for updates on Microsoft Ignite as there are various announcements coming out. Aside from the massive news that we all unofficially knew was the revelation that Microsoft Teams does not use SIP. Firstly, this is should not be a surprise to anyone as we can quite clearly tell that the audio, meeting and video experience in Microsoft Teams is based on Skype Consumer code, not LCS code like Skype for Business Server and Online are. When you research Skype consumer protocols and architecture, you release that it uses a proprietary signaling protocol and not SIP. So it is logical and accurate to determine that Microsoft Teams UC workloads use the same. However, this led to some tweets by people that perhaps misunderstood the message to be “Microsoft Teams doesn’t use SIP, SIP is Dead!”. This is completely inaccurate! There will be a lot of people with Skype for Business phones and other video devices and room systems petrified at the thought of this statement and it sends completely the wrong message to them. To set the record straight, your SIP devices WILL continue to work with Microsoft Teams using SIP in the same way in which they work with Skype for Business Online today! Your investment is safe! Although, you may have to ensure that device firmware is updated at some point (but that’s usual even for Skype!). To lay the context to this we must not forget that Microsoft Teams is an overlay application that uses components as services from Exchange, SharePoint, and Skype (not for business) together to create a collaboration experience for the end user. This means that each workload is not parent to Microsoft Teams specifically as a standalone application, but rather the Microsoft Teams end user client exposes the underlying service components to the end user through the Microsoft Teams User Experience as an “App” workload. Microsoft Teams does not use Skype for Business Online at a component level. However, there is a new unified communications core hidden away in Office 365 that Microsoft Teams utilises for its audio, video and meeting experience. It is this core that is replacing Skype for Business Online and it is this core that interops with Skype for Business Online, rather than specifically Microsoft Teams as an application. This new core as I said before is built on Skype consumer code. This does not mean that it uses the Skype consumer datacenters, network or PSTN services. That is separate! It is just the code framework they have copied over to develop an enterprise grade audio, video and meeting service, that is exposed to the end user through Microsoft Teams. This is the reason why you will still see the Skype logo in your audio, video and meeting experience. This can be best explained in this simplified diagram. So when we talk about Microsoft Teams does not use SIP, then at a technical level you are right on two points. The first point is that Microsoft Teams itself doesn’t require SIP, it is an end user UX App window that exposes different Apps such as Chat, Calling, Meetings etc. The second point is that the new Skype core service is based on Skype consumer code and therefore does not use SIP as it’s signaling protocol. Instead it uses Microsoft’s own signaling protocol called Microsoft Network Protocol version 24 or MNP24 for short. This protocol is wrapped inside a TLS encrypted TCP packet, which means, unless you have the private key for the Skype servers in Office 365, you ain’t gonna see it. However, what you need to understand is that this protocol is used between the Skype core and the App exposed with the Microsoft Teams client on your desktop. It does not replace SIP within the Microsoft Phone System. 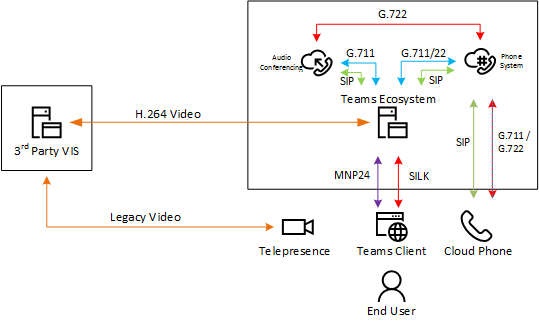 Another point to make is that the media codecs between the Skype app in the Teams client and the Skype core will be H.264 for video, SILK for P2P and Voice calls, and OPUS for meetings. But this will be only between the Skype core and the client the end user is using. At a higher level, the Skype core needs to interop with SIP, specifically the Microsoft Phone System and Audio Conferencing. The exact details of this we will never know. However, we can assume that v1 interop will be via some kind of transcoding and protocol conversion system, perhaps a software based SBC, or some other service. This allows Skype for Business Online to still leverage Microsoft Phone System and Audio Conferencing at the same time as the new Skype core. I can imagine that v2 interop will be more native and remove SIP between Skype core and Microsoft Phone System. This can only happen when Skype for Business Online has been retired. Polycom, Yealink (and other vendor) phones and meeting room devices will maintain the 3PIP model and Open SIP standards as well as having a Microsoft Phone System profile. These devices will more than likely register themselves to the Microsoft Phone System and subscribe to the Unified Presence service using SIP, rather than directly into the new Skype core. I don’t see this changing too much, or being far from the truth on this as for every vendor to convert their firmware to MNP24 would take longer than new Skype core vNext would take to be developed. There could also be hardware limitations too, so i’d expect these to remain SIP devices and leverage Microsoft Phone System directly, rather than being new Skype devices per-say. In summary, SIP is not dead and you should not be concerned with this drift away from SIP as far as the desktop / web client is concerned. MNP24 has been in Skype consumer since 2014 and is a robust protocol. It allows Microsoft to develop their own components without the limitation of standards based protocols, which is good for development, but also carries risk around compatibility. It is confusing why a company that has spent the last 10 years promoting standards based protocols would pull a 180 when all other vendors are embracing standards. But I am sure that they know what they are doing….. I guess a lot is still in the air and yet to sink in from Ignite. I am yet to form an opinion on the downgrade of Skype for Business Server 2015 to Skype for Business Server 2019. I need a few more nights to sleep on that first.